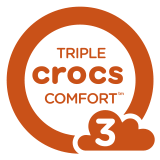 This is quite possibly the ultimate casual shoe — with relaxed good looks, capable, versatile style and Triple Crocs Comfort™. The uppers are handsome suede with a leather heel patch. Inside, memory foam pillows give you immediate sink-into-it softness while the foam footbed delivers support. It all rides on a Croslite™ foam outsole for even more cushion. This Chukka remains very light, a great choice for work, weekends or anywhere that calls for smart, casual style.